Narrow gauge heritage lines run on former standard gauge trackbeds in many parts of Britain. Mark Smithers outlines the history of one such line in South Wales and its motive power with a transatlantic flavour. Baldwin Pacific No. 2 departs from Pant with the first train of the day to Torpantau on August 28. The rolling stock consists of the railway’s entire complement of passenger rolling stock. The railway’s main building complex, consisting of station, restaurant, shed and workshops can be seen. The abandonment of parts of the standard gauge railway network deemed to be of no further commercial use during the post-Nationalisation era provided the railway preservation movement with the opportunity to reutilise their trackbeds in the construction of new narrow gauge leisure-orientated lines. 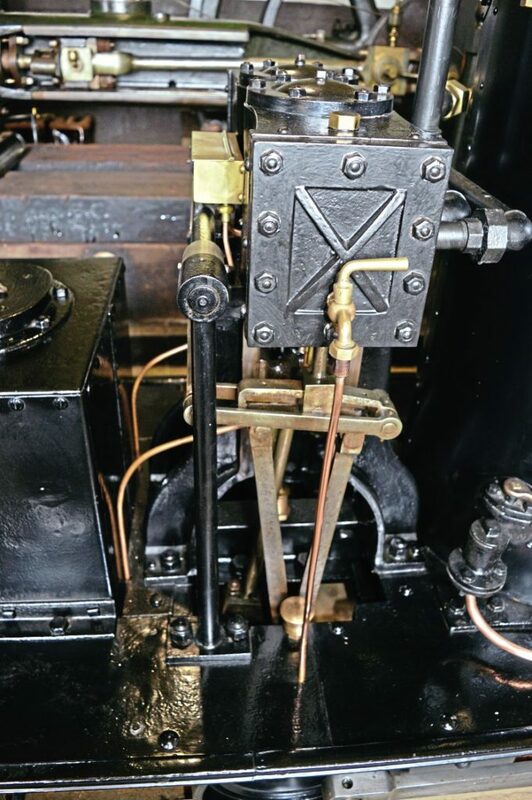 In many respects a precedent had been set for this trend many years earlier with the 1915 reopening of the Ravenglass & Eskdale Railway (admittedly a 3ft gauge line as built) as a 15in gauge system. More recent 2ft gauge steam-hauled lines created in similar circumstances include the Launceston Steam Railway; the Bala Lake Railway; the South Tynedale Railway and the subject of this feature, the Brecon Mountain Railway. There are no buildings at Torpantau, where the Baldwin Pacific is seen running round its train prior to the return working to Pant, which, unlike the outward trip, will entail a stop at Pontsticill. 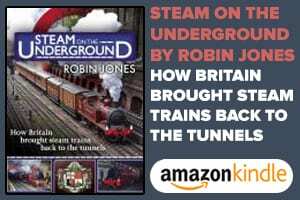 This system owes its trackbed to the former main line of the Brecon & Merthyr Railway, opened progressively during the 1860s and closed to passengers in 1961-2 and freight in 1964. Following over a decade of dereliction, the part of the trackbed that offered the most potential for development as a 2ft gauge railway was the five-mile section between Pant, situated some three miles north of Merthyr Tydfil, and Torpantau, the summit of the original line and some 1313 feet above sea level. Want to read more? Then why not purchase our Issue 243 from June to check out more on this story! Just click here! Following the closure of the original railway, the bridge girders had been removed for scrap and there was no trace of the original rails or ballast. The land had been sold off to 13 different owners, including the original station site at Pant, which was not available for acquisition by the new venture and hence a new terminus was required on an adjacent plot. Seven new bridges were required and while Pontsticill station and signalbox buildings were still in existence, they needed a considerable amount of restoration work to be fit for reuse by the new railway. The course of the line, as depicted in an ‘altered’ Ordnance Survey map on sale in the railway’s shop. The project was undertaken from its inception by a partnership involving the late Tony Hills and Peter Rampton. The process of obtaining the necessary legal sanction for a reconstructed line, as was to be expected, was a protracted one and it began in 1972, taking some six years in all. The work comprised obtaining the necessary planning permission for the works and a Light Railway Order. During 1979-80, track was laid between Pant and Pontsticill and a small workshop established in the old waiting room at the latter station, in addition to storage facilities. A bogie carriage was built to accompany the first locomotive to work over the new line on its opening in June 1980, namely formerPen-yr-Orsedd Quarry Hunslet 0-4-0ST Sybil (No. 827 of 1903). 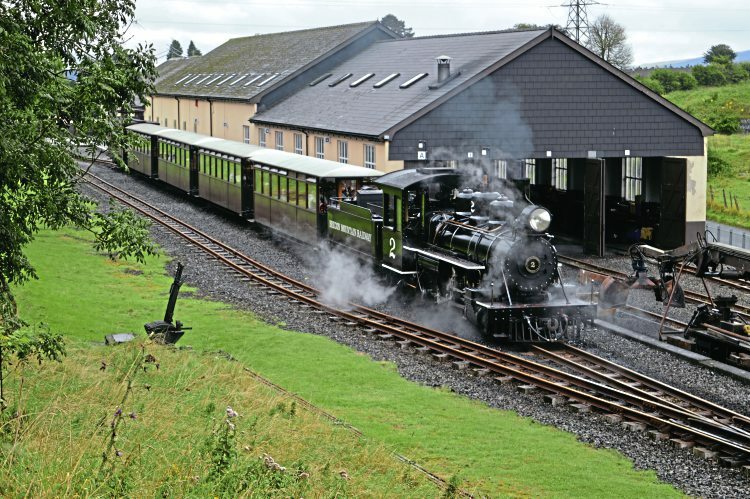 The Brecon Mountain Railway quickly established itself on the South Wales tourist map and a new station and two-level workshop complex was built at Pant between 1982 and 1996, including booking, toilet, café and shop facilities plus a car park. The addition of further passenger carrying capacity ensured that, within a season, Sybil had yielded its place as the line’s main source of motive power to Graf Schwerin-Lowitz. 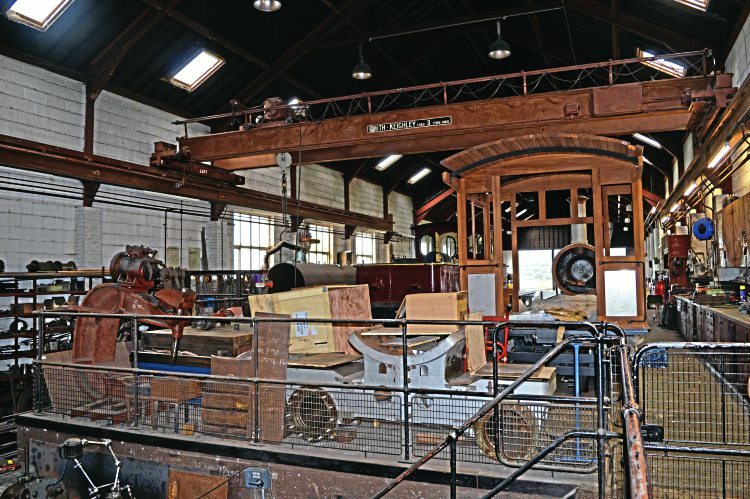 The split-level shed/workshop complex at Pant is equipped with an extensive range of machinery, some dating from the 19th century, including a lathe from Southend Pier, once used for turning tram wheels. Some idea of the size of the undertaking can be appreciated from this view of the upper level looking towards the shed doors. Initially restored in the original workshop at Pontsticill, this 1908-vintage Arnold Jung 0-6-2WT+T (No. 1261) came from the Mecklenburg-Pommersche Schmalspurbahn in what, prior to the fall of the Berlin Wall, was East Germany. The design of this locomotive shows a certain family resemblance to 0-6-2Ts built by the same maker for Namibia’s Otavi Railway prior to the outbreak of the First World War and it is pleasing to record that a sister engine survives in California. By the end of the 1980s, the number of passenger carriages had risen to four. These were all constructed to one design incorporating end verandahs, with ex-South African Railways bogies and drawgear obtained from the Isle of Man. 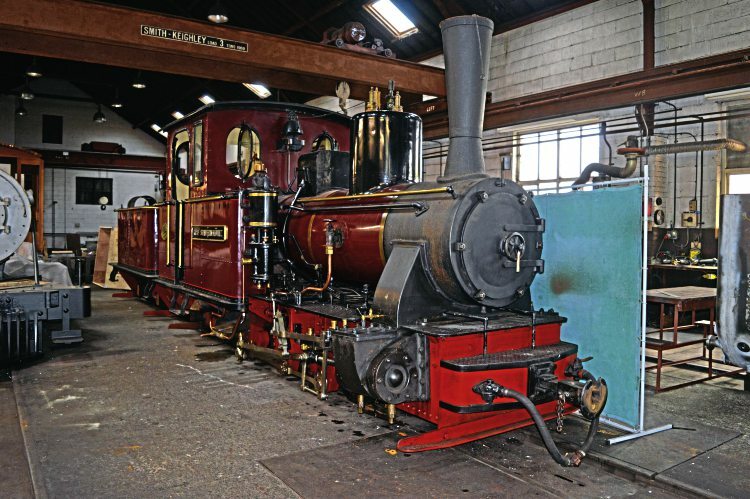 Under restoration in the workshop complex at Pant is No.1 Santa Teresa, with its characteristic US-pattern smokebox and cylinder configuration very much to the fore. This locomotive has had a varied career, having started life as a 2ft gauge 2-6-0 for the Mogyana Railway in Brazil and spent the latter part of its spell on the South American continent as a 2ft 6in gauge unit. This locomotive will re-enter service returned to its original gauge but as a 2-6-2. In addition to the benefit of better riding characteristics in reverse, the addition of a rear pony truck also allows for better accommodation for the crew in the commodious cab. The value of Graf Schwerin-Lowitz to the Brecon Mountain Railway during its first two decades of operation cannot be understated: it was the sole effective source of steam motive power from 1981 to 1997 and the first of the railway’s locomotives to avail itself of the boiler manufacturing facilities installed in the workshops at Pant, being fitted with a new boiler made in 1993 and having run over 125,000 miles in service prior to its eventual superseding as the main source of passenger motive power. 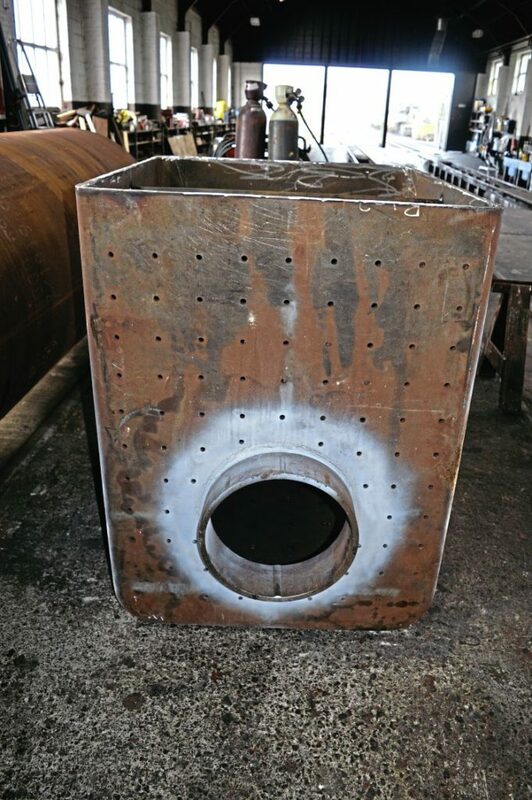 The rear of Santa Teresa’s inner firebox, showing the holes drilled for the stays and the firehole ring. 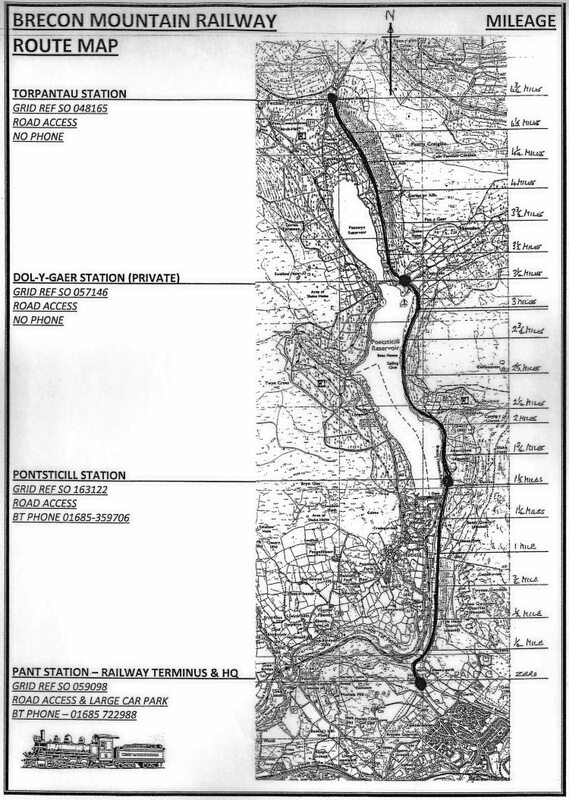 By May 1994 it was announced that the railway was to be extended from Pontsticill a further 1¾ miles in a northerly direction along the original trackbed to Dol-y-Gaer and this extension was completed in time for the 1995 season. The work that was carried out involved the total replacement of three bridges and extensive repairs to a further five. It was partly financed by a £25,000 grant from the Development Board for Rural Wales. This section of the route skirts the Lower Pontsticill and Upper Pentwyn Reservoirs and was constructed using 75lb/yd rail and Australian Jarrah sleepers. Dol-y-Gaer station building, although still extant, was not available for acquisition and re-use by the BMR, as it is now owned by the South Wales Scouts Council. The summit of the original trackbed, Torpantau (1313ft above sea level) remained the ultimate realistic goal however, and by May 2004, track had been laid at the current terminus of the line. The site chosen for the terminus was on land adjacent to the original formation and to the south of the re-aligned road that currently separates the railway from Torpantau tunnel. Graf Schwerin-Lowitz in the workshops beneath the Smith-Keighley 3-ton overhead travelling crane. 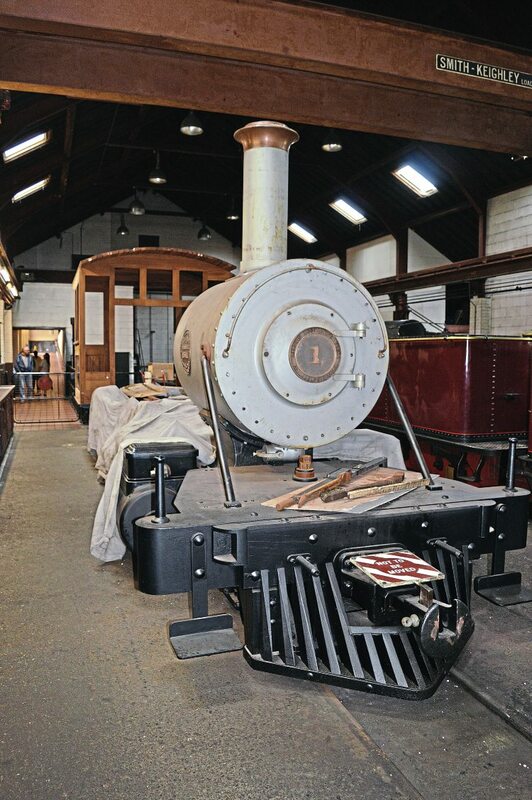 The engine is in sound mechanical condition, but is not the first choice for passenger operation, as it is too small to handle fully-loaded trains between Dol-y-Gaer and Torpantau. Further extension of the line to enable it to pass through the tunnel would entail the construction of a new bridge to cross this road, and given the work involved, is not currently thought to be a feasible undertaking. The current Torpantau extension was officially opened on April 1, 2014 and current standard operating practice is for passenger trains to run nonstop between Pant and Torpantau on the outward journey, with a 15-minute stop at Torpantau and to take a 25-35-minute stop at Pontsticill on the return trip, allowing passengers to alight and take advantage of the facilities on offer, namely a tea room and the steam museum, before continuing their journey on the same train, or if available, a later one, back to Pant. The coupled wheel centres for No. 4 in the lower level workshop. The 1980s and 1990s were certainly not uneventful years for the BMR, as between December 1988 (when the relevant contracts were exchanged) and 1996, it and the Vale of Rheidol Railway were in the common ownership of the Rampton-Hills partnership. Consequences of this move included the conversion of the three VoR 2-6-2Ts from vacuum to Westinghouse braking in the workshops at Pant, and also the construction of a new 0-6-0 diesel-hydraulic locomotive for the VoR (No. 10) in 1987 from components obtained following the liquidation of Baguley-Drewry Ltd (a similar locomotive being constructed for use on the BMR). Other locomotives were also to be seen in store on the BMR during this period and these included ex-South African Railways NGG13 2-6-2+2-6-2 Garratt No. 77 (Hanomag No. 10629 of 1928) and a classic Hudswell Clarke ‘9in by 15in’ 0-4-2ST Santa Ana (No. 640 of 1903), originally supplied with sister engine San Justo (No. 639) to the San Salvadore Spanish Iron Co system near Santander for £755 apiece and ending their revenue-earning careers on the SA Huellera-Vasco Leonesa’s system at the Matallana de Torio Collieries, where they worked until 1971. In company with San Justo’s chassis and other components, Santa Ana was stored at Pant for several years, but today these precious Leeds-built relics are currently out of public view in storage in Surrey, having departed from South Wales after the dissolution of their partnership in 1996 and the transfer of the BMR to the sole ownership of the late Mr Hills. 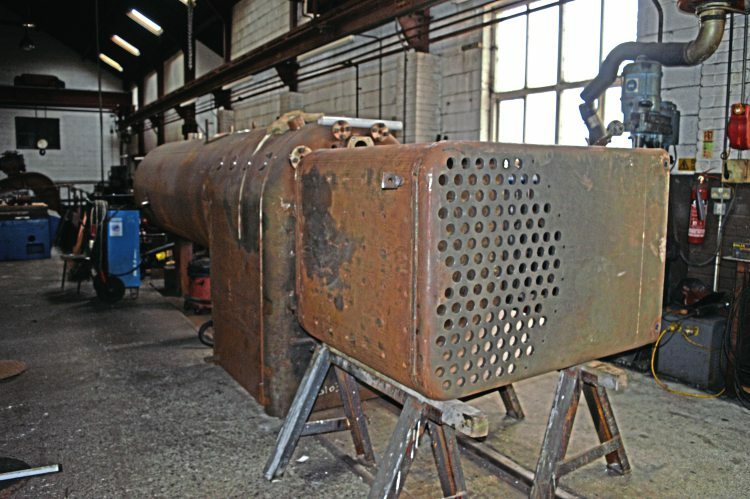 Work is also proceeding well on the boiler and firebox for No. 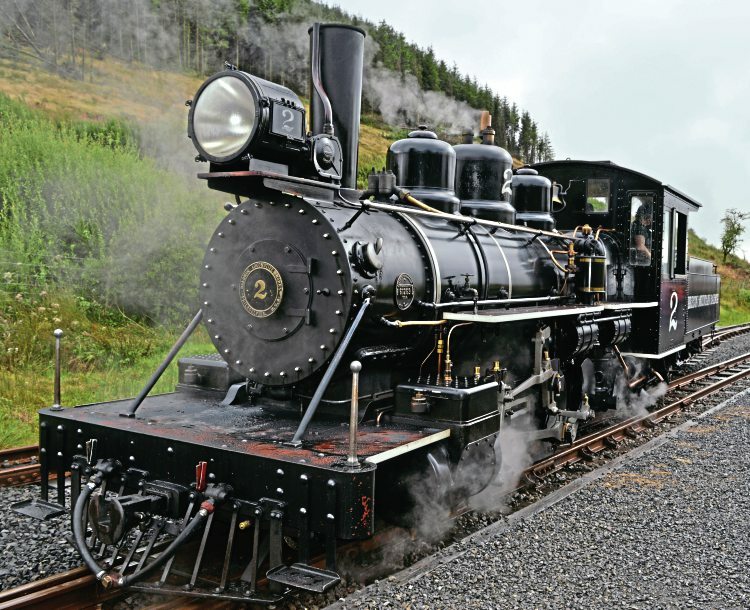 4, a replica of 1916-vintage Sandy River & Rangeley Lakes Railway ‘Forney’ pattern 2-4-4T No. 10. Unless there are any efforts elsewhere in the UK to alter the situation, when completed the engine will be the only domestically based representative of its type. When one takes into account the severe gradient on the section of railway between Doly-y-Gaer and Torpantau, a case could certainly have been argued for restoring No. 77 to working order for use on the BMR. long-term solution to satisfying the line’s need for a more powerful locomotive and some renovation work was indeed carried out, but in fulfilling this need, events were ultimately to take a different turn and today, No. 77 is to be found in static condition at the Exmoor Steam Railway at Bratton Fleming, in company with other ex-SAR 2ft gauge locomotives, having been sold to the Stirland brothers in 2002. 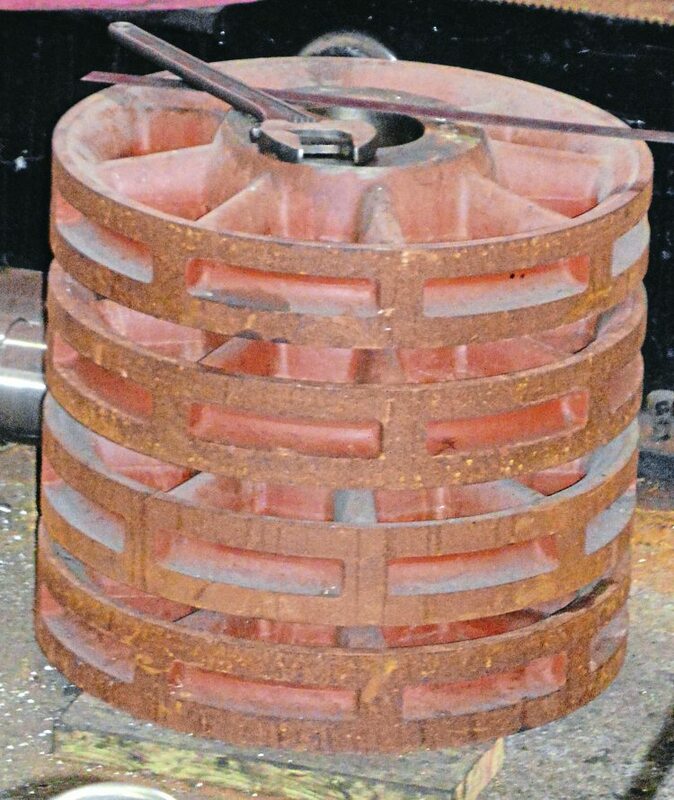 Although inspired by the 3ft-gauge De Winton locomotives then in use in the Penmaenmawr slate quarries, Redstone differed from them in general design as built by having a free-standing (as opposed to boiler-supported) cylinder/steam chest layout and also by having uncoupled wheelsets, although coupling rods were later fitted at Trefor quarry, when a short-lived attempt was made to put the engine to serious work. South Africa was also the workplace of another of the locomotives acquired during the formative years of the BMR project, and one whose impact on the line’s development was destined to be more profound than that of the Garratt. In1930 Baldwin, of Philadelphia, USA, supplied to the Eastern Province Cement Co Ltd of Port Elizabeth a Pacific officially classified by the makers as 12 20¼ D.11 (works No. 61269). 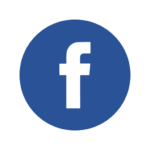 Subscribe to Heritage Railway here! This outside-framed locomotive, with 13.5in by 18in cylinders, 3ft coupled wheels and an approximate total weight in working order of 50.5 tons, was built to a design based on the SAR NG10 class of 1916 vintage with some detail differences. Although its bar frames, cab and tender design and cylinder/smokebox saddle configurations clearly betray the type’s US pedigree, the engine, along with its NG10 precursors, was built with a Belpaire firebox, a requirement of a customer based in a country under significant British influence at the time of its construction. The Baldwin Pacific underwent a certain amount of modification during its 44-year career hauling limestone trains in South Africa, including to its tender, sanding arrangements, cab and chimney. In 1974 its revenue-earning days in the African continent were brought to an abrupt end by a derailment following a runaway while it was left unattended. The accident resulted in a considerable amount of damage, especially to its front end and it was written off, being shipped to the UK as deck cargo through Liverpool during the following year. Given the amount of work necessary to repair the damage to the engine and return it to working order following initial dismantling, full restoration was an extensive process and was undertaken during 1993-7. Following this work, the engine re-entered service as BMR No. 2 with its appearance restored as far as was possible to its original state. Since its return to service, No. 2 has proved to be a boon to the railway, as unlike Graf Schwerin-Lowitz, it is able to handle fully-loaded passenger trains over the section from Dol-y-Gaer to Torpantau. Although displaced as the BMR’s main source of passenger motive power in 1981, today Quarry Hunslet 0-4-0ST Sybil is to be found in the museum. 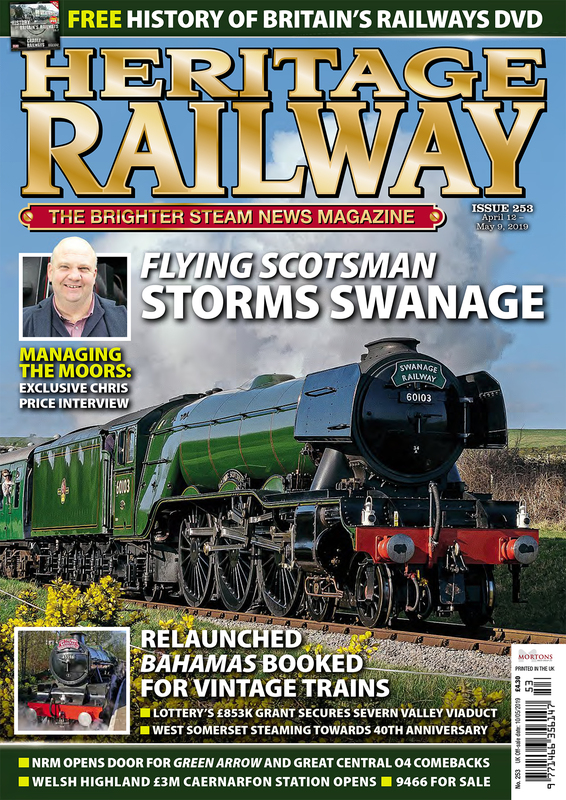 Following the 1996 partnership dissolution, and with the BMR now under the sole influence of Tony Hills (who died on May 26, 2015), the US influence on the railway’s steam locomotive practice was strengthened by a further acquisition. In 1990, a Baldwin 2-6-0, originally built in 1897 (No. 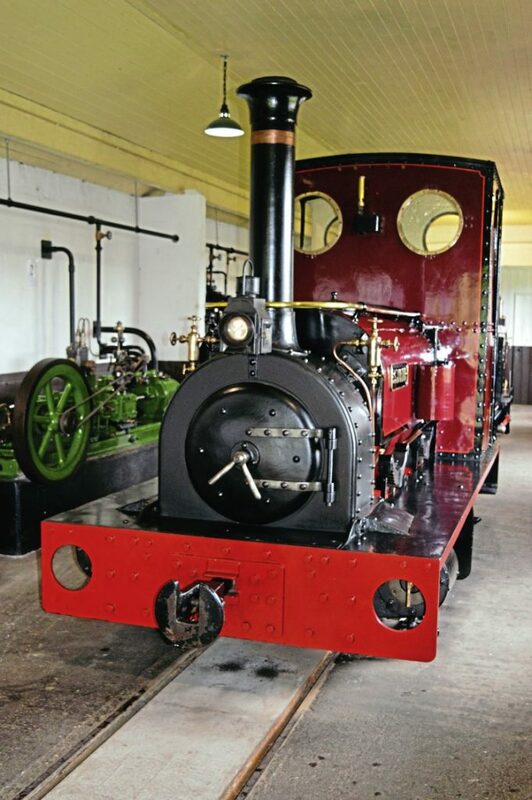 15511) to 2ft gauge for the Mogyana Railway in Brazil and converted to 2ft 6in gauge when sold to the Santa Teresa sugar mill (being given a non-original tender) was imported into the UK and initially based at the Ffestiniog Railway. Although some restoration work was carried out on the engine, it was eventually decided to re-sell it and in 2002 No. 1, as the locomotive has now been designated, arrived at Pant. Given the fact that this much-modified locomotive has been out of service since 1976, it is no surprise that an extensive rebuild is necessary, and in deciding what form this should take one important fact about the BMR has to be appreciated, namely that it has no turntable facilities at present. It has been decided to incorporate a trailing truck to mitigate the potential for poor riding characteristics during tender-first working on the return run from Torpantau to Pant. This measure has the added benefit of allowing for a larger cab, thereby eliminating the weakness inherent in many US tender locomotives without trailing trucks, namely the effective separation of driver’s and fireman’s spaces by the firebox. In addition to the work necessary to return No. 1 to its original gauge, a new tender has been built and a new boiler and firebox are also in the process of production. Once these are complete, the engine will be ready to re-enter service and it will be a useful addition to the line’s motive power fleet. 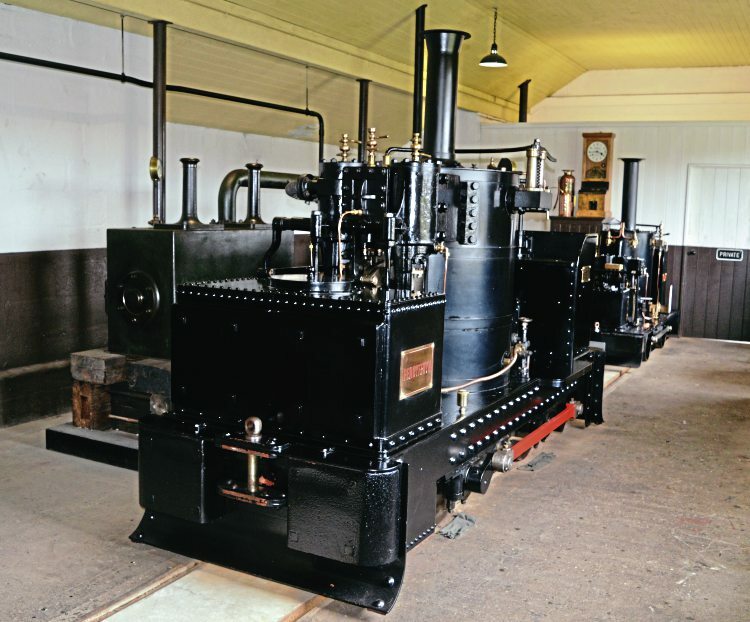 By way of comparison with Redstone, the museum also contains the former Pen-yr-Orsedd De Winton locomotive Pendyffryn of 1894. Given the extensive work that has been necessary to restore Nos. 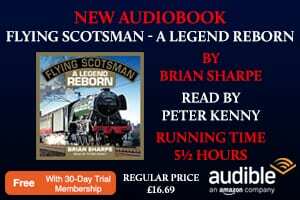 1 and 2 to running order and the facilities now available at Pant, it was a relatively short step from such work to the construction of completely new locomotives on similar principles.